If you have a kid that loves games or loves the Minions, this would be a fun gift idea for the holidays! You can grab Despicable Me 2 Battle Pods Game for only $11.75! You will be saving 41% on this purchase because this fun game is normally $19.99! Make sure that you grab this deal soon on Amazon because the prices can change at anytime on Amazon! 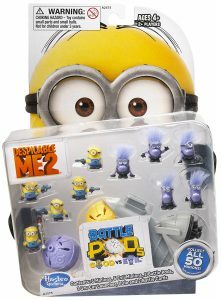 CLICK HERE TO ORDER the Despicable Me 2 Battle Pods Game for only $11.75 today!